The team is focused on improving every week and peaking at the right time ahead of conference championships. After a lifetime of training and battling two season-ending injuries as a George Washington University gymnast, Alex Zois is ready to leave it all on the floor as she gears up for the last few weeks of her competitive career. Ms. Zois, B.S. ‘18, a first-year graduate student working toward a certificate in emergency management in public health, said she and her teammates have been working hard all season to peak at the right time. 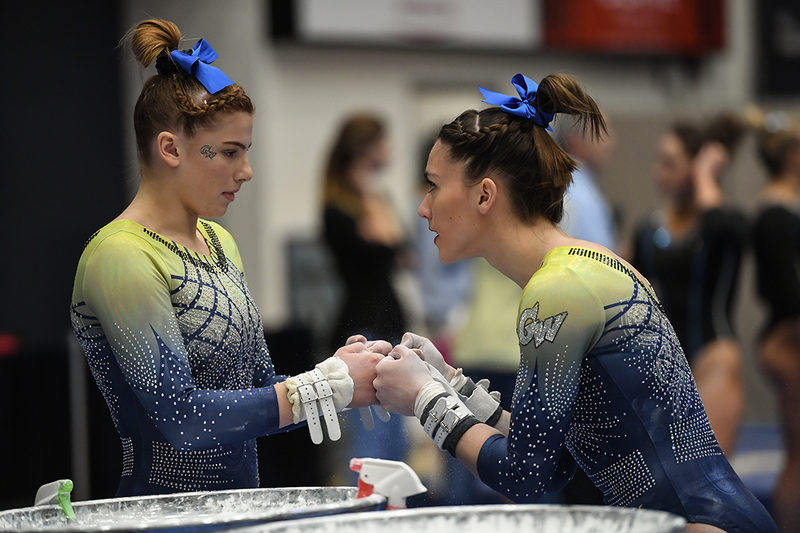 They hope to take home the East Atlantic Gymnastics League (EAGL) Championships trophy this Saturday and become the first GW gymnastics team to qualify for NCAA nationals. Working toward these goals as a team has helped keep the student-athletes motivated, but knowing she will hang up her leotard for good in a few short weeks has given co-captain Ms. Zois extra motivation to keep pushing her limits. Ms. Zois injured her ACL—a ligament in the knee—warming up before her first competition as a first-year student-athlete. Because she sat out that season, she was awarded an additional year of eligibility. When a knee surgery last March forced her to end the season early, she knew she had more to prove and chose to return to the team as a graduate student. As an all-around athlete, Ms. Zois competes on every event, and recently scored a career-high 9.925 on vault. Ms. Zois earned a career-high all-around score of 39.425 at Senior Night on March 1. She matched that all-around score again at Towson on Sunday. As one of two fifth-year student-athletes on the team, Ms. Zois is a natural leader. She works hard to keep a positive attitude and help the team stay motivated to achieve its goals. Her injuries have helped her build resilience, and those experiences have positioned her well to help her teammates who go through similar trials. Ms. Foster-Cunningham said Ms. Zois has mastered the art of being a teammate. While the gymnasts face another team in competition, they are also competing against each other for a spot in the lineup and event titles. Ms. Zois is always genuinely happy for her teammates’ success and embodies their “All Team” motto. Ms. Zois has been training as a gymnast since she was five years old. The Crofton, Md., native says adjusting to life outside of daily practices will be a big change. Ms. Zois plans to take a gap year to study for the MCAT. She hopes to attend medical school and become an orthopedic surgeon. She encourages her teammates to take advantage of every opportunity to compete and train for the sport they love. The GW sophomore has been training five hours a day to compete against short track’s rising stars.